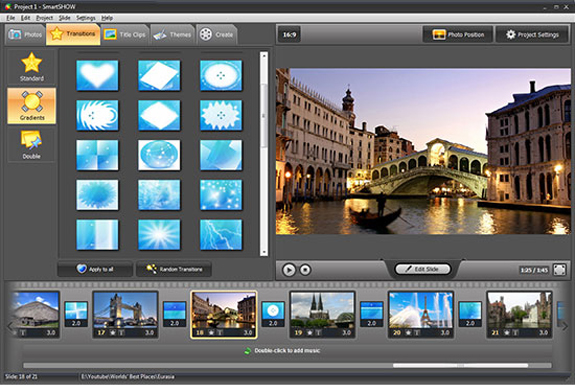 Want to create cool animated photo slideshows, but intimidated by programs with a steep learning curve? Why not get up and running in just three easy steps using today’s discount software promotion, SmartSHOW? SmartSHOW lets you transform still photos into thrilling photo movies in just three steps. With SmartSHOW, you’ll benefit from a handy wizard that walks you through the process quickly and easily. 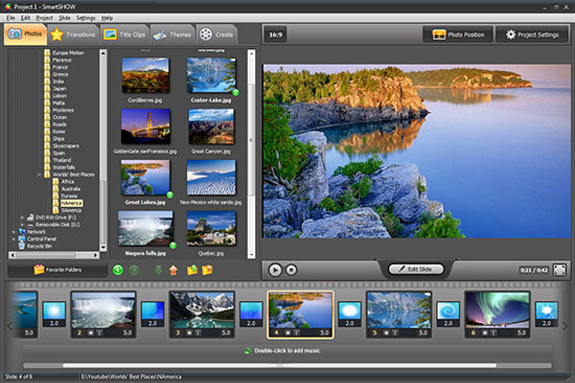 In fact, SmartSHOW is easier to use than you think, since the program comes with templates for all occasions that are just waiting for you to fill with your own images and soundtrack using convenient Drag & Drop interfaces. Adding your own stuff to a template isn’t all you can do with SmartSHOW. In fact, you’ll probably get lost (in a good way) playing around with the amazing collection of motion and artistic effects that you can implement in your slideshows. Add captions and titles! Play around with gradients and textures! 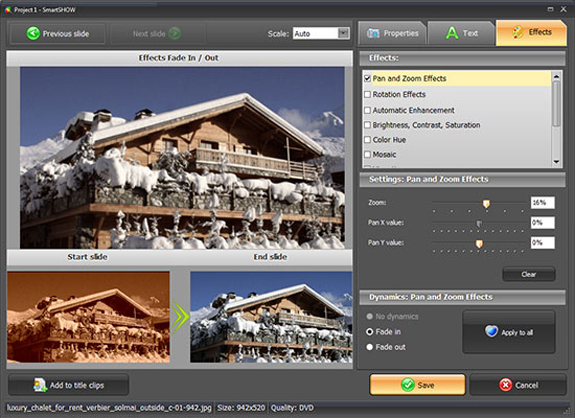 Enhance your images inside of SmartSHOW without having to boot up a different graphics program! When you’re done, you can share your SmartSHOW masterpiece in full HD video, or share it online in a web-optimized format that won’t eat everyone’s bandwidth. Please note folks: to read more about SmartSHOW 3D Deluxe (the product offered in the up-sell), you may click here! After you purchase SmartSHOW it may be used indefinitely. SmartSHOW is licensed per computer, and not per user. > Transfer of a license to another owned computer is not allowed. Hm, that means in case the computer dies my paid 3D license is lost? The fine print terms are for the free giveaway version of SmartSHOW, NOT for SmartSHOW 3D which is just an additional offer here today. So you don't need to worry - you are certainly allowed to transfer your SmartSHOW 3D to a new computer if you have issues with the old one. phoe monroe One of the best slideshow makers on the market, in my opinion. I believe you can only add videos to the slideshow in the Deluxe version. Paying $17 for the deluxe version is a real bargain, in my opinion. That's what I did. If your PC dies, or you want to transfer this product to a new computer, simply install it and re-enter the license key. The license on the old PC will just be removed. Mike Shanahan Hello! I currently use a competing product and your software looks much more user friendly. This is NOT a deal breaker but I am wondering if your software allows the use of video in the slideshow itself? As in a ski trip slideshow - photos, a 30-second video clip of my son having a classic moment on the slopes, more photos, another quick video clip, etc. Look forward to hearing from you. Oh! I am looking at the 3D Deluxe version in case that matters for this functionality. Lesley Knight @ jacques robert - please contact our tech support at http://slideshow-maker.com/support.php - they'll help you register the software. Lesley Knight @ Mike Shanahan - thank you for your feedback! 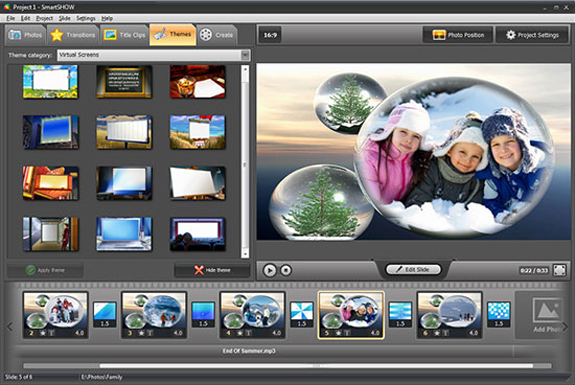 Yes, exactly, you can combine photos & videos in SmartSHOW 3D Deluxe (not in SmartSHOW Standard which is a good choice for those who are just starting to make slideshows). Here's a video demo that should give you an idea of what you can make with the 3D version https://youtu.be/06gLQnRucOY - there are a few types of animated photo collages and video collages. 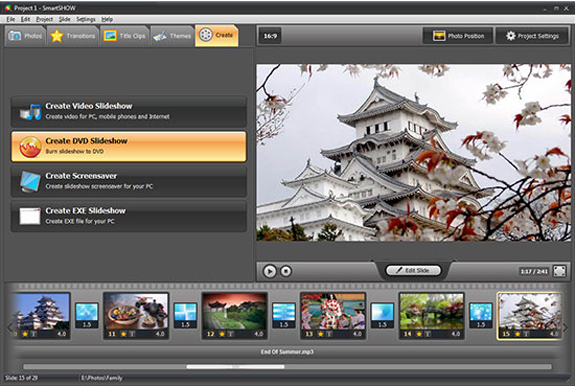 And of course you can as well just add a video clip in between the photos. Silvano Quattri The price of version Deluxe in not $ 17 but $ 20.74. I suppose it must be some tax like VAT added in your country. The price here doesn't include taxes as BitsDuJour have an international audience. If it's the VAT, you'll see a note in the shopping cart. It could also be Extended Download Service - this is optional and you can remove it from the cart. Should you have any further questions regarding this order, please contact our support team at https://slideshow-maker.com/support.php - they'll help you asap.